RIB Adventures in the Solent. Operating from Ocean Village Marina Southampton, Seadogz offers an experience that is unique and like no-other! Whether you are looking for a breath-taking, white-knuckled adventure on the Solent or an enjoyable corporate experience, Seadogz has the experience for you. Seadogz are specialist in providing the ultimate service along with the safety and peace of mind that comes with some of the most qualified and experienced skippers. As professionals of the sea, Seadogz offers a range of experiences designed to suit any group size or budget. Our exhilarating Rib Taster Experiences, and Treasure Hunts, are just some of the Experiences on offer. Whether you are looking for a group day out or a fantastic present idea, we have RIBs available for private charter or on a single–ticket bases. Contact us to plan your perfect day out. If you haven't seen what you are looking for then please contact us for a tailor made experience to suit your specific needs. Out to impress clients, reward staff, or just looking for the time of your life; Seadogz can put together a package that meets your needs and budget. Seadogz are also available for Commercial Rib Charter projects such as film work and media activities, please contact us for further information. Don’t forget- photos from your trip will be available to download from our website- FREE OF CHARGE! Just click the photo tab at the top of the page to find your pictures. Warning! Adrenaline fuelled "Wet'n'Wild" experiences are NOT for the faint hearted, approach with caution. That is, unless you really, really want to get your pulse racing! Safety: It is our experience that allows us to provide the safest possible maritime events whilst taking into account sea and weather conditions. This can only be done due to the high calibre of trained skippers and crew, or active lifeboat personnel that we have on board. 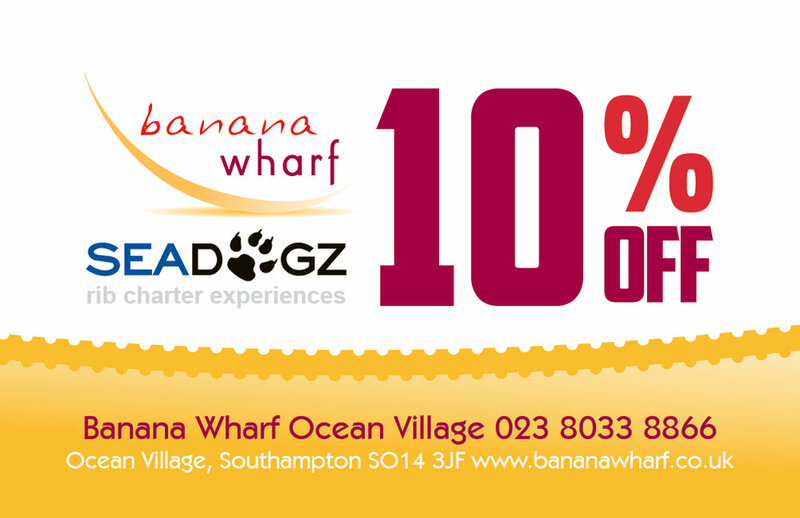 10% discount in Banana Wharf with every Seadogz booking! Team Building with a Difference. Arr me hearty! If ye be looking for a bountiful and swashbuckling treasure hunt likes that of Captain Jack Sparrow, hunting down your doubloons, Seadogz have the adventure for you. Be a buccaneer and enjoy this unforgettable Rib treasure hunt on the Solent. Skippered RIB Charter In The Solent.